I love her wide cheeky grin! And I lover her yellow tie too. Love the blog, keep the pictures, Insha'Allah. 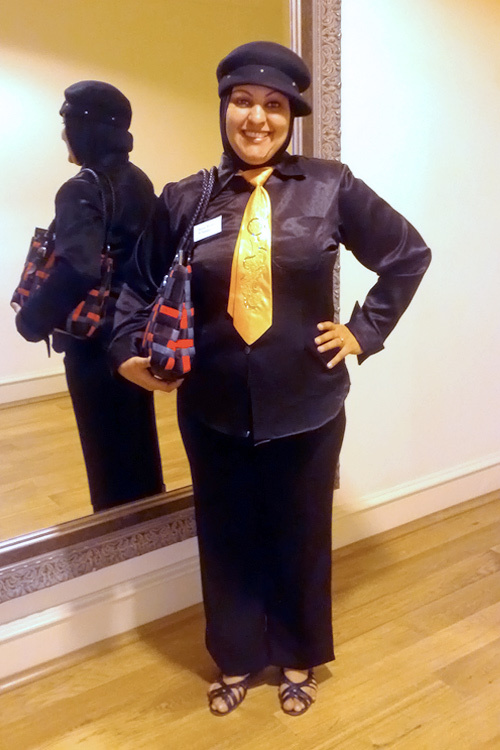 The tie and hat hijab are sweet! Nice combination, I would love to try a tie and hat. The hat and tie are unusual - good on her to be so different and quirky! :) She pulls it off! I think this is her work uniform (see the name tag? )- it's great that she is able to wear hijab with it and look so happy! No it's not a uniform, Clare - I don't blame you for thinking so :) She was a journalist at a conference I attended earlier this year, and the styling is all her! I thought she was wearing an uniform too! I like the idea of wearing a hat with hijab- I want to try it too. Corrected, lol :D It's still really cute.